Numerous studies have shown that people who are religious are happier in life. Now, a new study has found those who believe in God with no doubts are more likely to strongly disagree with the idea that life does not have meaning. Stephen Cranney of the Population Studies Center at the University of Pennsylvania recently conducted the first large scale study that empirically tests the association between belief in God and feeling a sense of purpose in life. 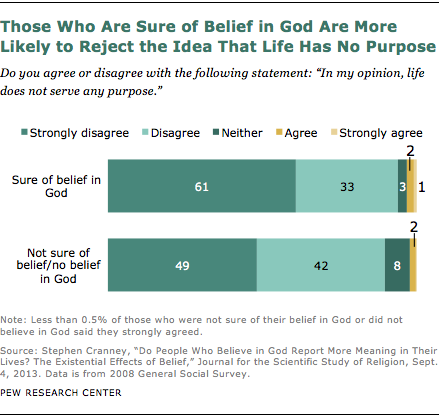 Survey respondents who said they believe in God with no doubts also disagreed most strongly (61%) with the statement “In my opinion, life does not serve any purpose.” Those who said they were certain they did not believe in God or who expressed more uncertainty about their belief were less likely than strong believers to reject the statement that life has no purpose. (Only 49% said they strongly disagreed ). There were no statistically significant differences between those who were uncertain and those who did not believe in God. Looking at believers and non-believers combined, a large majority of all respondents strongly disagreed (56%) or disagreed (36%) that life does not serve a purpose, with only 3% saying they agreed or strongly agreed. The latest data on happiness and religious belief from a Pew Research Center survey shows religious people, on balance, are happier than nonreligious people.